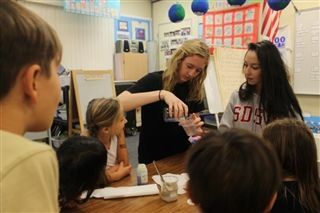 On Tuesday, March 29th, Upper School Service Learning group Educating Near & Far visited a first-grade class at Cardiff Elementary School. As part of their mission to empower children through STEM education, group members led the students through several simple, hands-on science experiments involving water. Using fun, tactile materials including hydrobeads and magic sand, the group demonstrated the concepts of hydrophobic vs. hydrophilic molecules. The lessons were such a hit that the group is already planning to return with new material in a few months.